As new composites are introduced (almost daily), toolmakers are responding with effective solutions to help lower machining costs and even solve production floor management problems. 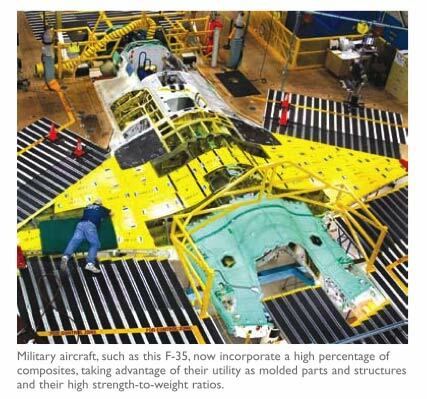 As detailed by a case study below, Lockheed Martin Aeronautics Co. recently carried out a process change on its F-35 fighter development, allowing it to acquire and control cutting-tool geometries and achieve longer tool life cycles. There is a growing demand for tool innovations to cut, shape and drill composite material applications in almost every industry sector. Composites, each presenting a unique composition and set of characteristics, are competing with and replacing traditional building materials - steel and aluminum - at a rapid rate. Commercial and military aircraft now incor- porate a high percentage of composites, taking advantage of their utility as molded parts and structures and their extraordinary strength-toweight ratios (see ratio table below). In Boeing's next generation commercial aircraft, the 787 Dreamliner, 50 percent (by weight) of its primary aircraft structure will be made of composites. Inherently, no two composites are the same. Their marbled internal texture is nothing like the uniformity of aluminum or steel, which can be expected to remain consistent from a drill's entry point to its exit. With composites, it's not so. Carbon fiber reinforced polymer (CFRP) is composed of a matrix base material, reinforced with a mix of strong carbon fibers. These fibers either can be laid out in a consistent direction or opposed weave pattern. Composite layers are. stacked upon others to form composite blocks, boards and molded shapes. To add mass, foam or honeycombed core structures may be inserted between composite layers or attached to them. Layered and molded configurations are designed according to the specific need and use of the part that may be several inches in thickness. While core layers can strengthen a composite form, composite material strength is primarily due to its ratio of extreme strength to slight weight, a ratio that translates into lighter, faster, better, for most developers and manufacturers. The CFRP strength ingrethent, carbon fiber, is many times stronger than aluminum and even the hardest steel. CFRP tensile strength ranges between 1,500 to 3,500 MPa (carbon fiber alone is shown in the chart below) as compared to aluminum, at between 450-600 MPa and steel, at 750 to 1,500 MPa (MPa is a metric unit for pressure, or force per unit area). As for weight or density, carbon fiber-epoxy has been rated at a low 1.52.0 g/cm3, compared to aluminum at 2.76 and steel at a whopping 8.01. A tool's cutting edge hardness and geometries are two critical factors to consider when choosing the tool for your job. Of the two, correct geometry is of primary importance because the efficiency of a tool is determined by the geometry of its cutting edge. There are currendy three tool choices able to withstand the punishing hardness of today's composites. They are solid carbide, diamond coated carbide, and polycrystalline diamond (PCD). An industry standard, the solid carbide tool continues to be the most widely used tool for machining composites, as well as traditional materials. It has been in use for over 50 years. Widely and readily available, this tool can accommodate the broadest range of cutting geometries. The low commodity price of carbide allows operations to consume many units before approaching the cost of using PCD tools. Additionally, the solid carbide tool can be re-sharpened many times, further extending its effective life. The Chemical Vapor Deposition (CVD) diamond coated tool is a solid carbide tool coated by a protective diamond surface that extends up to 10 times its useful life cycle. Among the variety of coating processes, the preferred (CVD) diamond coating was commercialized nearly 20 years ago for nonferrous cutting tool applications. CVD diamond coating is a well-established technology for machining graphite and hard carbon material. CVD diamond coatings consist of 100 percent pure diamond crystals that are actually grown in a vacuum chamber using super-heated filaments to activate hydrogen and methane gases. The resulting vapor mixture bonds to the surface of tungsten carbide in thickness that is controlled within a range of 3 to 30 microns. Diamond coatings protect the entire cutting surface of complex geometry tools. Unlike the cobalt binder used in making PCD tools, the chemically inert properties of diamond do not react with composite resins during machining. Increasingly, with the right tool geometries and recent advances in multi-layer coatings, even extremely abrasive composite materials are being efficiendy machined to exact tolerances using diamond-coated solid carbide tools. A diamond coating on a solid carbide tool preserves the tool's edge geometry while protecting the tool's entire surface and can extend its useful life by as much as 10 times. The polycrystalline diamond tool is a synthetic diamond product produced by ultra-high pressure and heat applied to a diamond powder mixed with a metal matrix binder. There are basically two types of PCD tools. 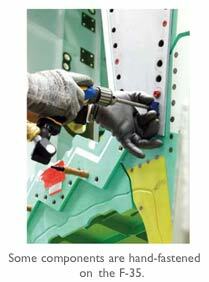 One uses a brazing process, inserting a PCD blank into a groove that has been cut into a carbide tool body. The other uses a sintered vein process that bonds diamond powder and binder that is inserted into a groove along the carbide body. Heat and pressure are then applied to create the PCD and at the same time bond it to the carbide tool body. Both PCD technologies produce diamond-hard cutting edges. However, PCD geometries are limited and their cost is comparatively quite high due to an expensive and lengthy manufacturing process. The unit cost of a PCD tool ranges from three to five times the unit cost of a competitive coated tool and as much as six to 10 times that of a non-coated carbide tool. Lockheed Martin Aeronautics Co. manufactures major components for the F-35 Joint Strike Fighter, the next generation fighter jet being developed by the U.S. Department of Defense and eight other partner countries. As described below, the company achieved improved quality machining results in less time while significantly reducing total tool cost. When faced with a tooling change, testing at Lockheed revealed that precise cutting edge geometries allowed operators to gready reduce span time and increased feed rates. The resulting tool and process change netted a 450 percent increase in the number of holes drilled per tool. After implementing the Amamco tool into the process program, test results showed the CVD diamond coated drill produced over 1,200 holes compared to 275 produced by the PCD drill on the same task. Test results also showed a reduced span time of 75 percent and an increase in feed rates of 12 times faster than the original drill. 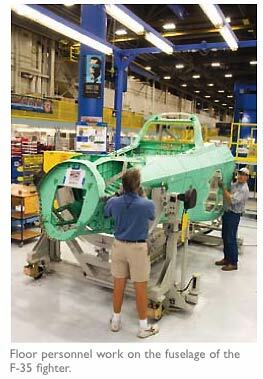 In the aggregate, Lockheed achieved a 97 percent reduction in tool cost. The process change savings represent substantial cost reductions over the course of manufacturing the expected 2,783 F-35s planned for production. Speeds and feeds play a major role in the performance of any cutting tool, especially when working with today's advanced composites. Keeping thrust to a minimum can reduce heat and friction created at the cutting edge, as do protective coatings. Less heat and friction at the cutting edge will result in a longer tool life and a higher quality cutting edge or surface. CVD diamond coating, a true 100 percent diamond crystal, reduces heat and friction created by the highly abrasive composite environment and protects the geometry advantages of the solid carbide tool. There are cases where each of the three tools described would be suitable and each has characteristics appropriate for the application you may be considering. Solid carbide will remain the tool standard for machining composites, and both PCD and CVD diamond coating solutions are increasingly available. Tool choice will likely continue to be based on budget and shop floor factors that are complex and often complicated by material availability and project schedules, beyond the control of production managers. However, tool performance and choice will increasingly be based on the two attributes determining a cutting tool's effectiveness and efficiency: cutting edge geometry and hardness.